Ok so for today I’ll just like to talk briefly about the 501st Legion. The 501st Legion is a worldwide non-profitable volunteer group set up in 1997 in the US dedicated to dressing up as (mainly) Stormtrooper and other villain characters from the Star Wars universe. It is the only costuming group recognised by George Lucas. 44 Responses to Who is TK-8316? I don’t mind joining too! sure. there’s a Philippine Outpost which u may want to check out. 8316 is your date of birth? Oi! I missed your last post. *waves hand* you don’t need to see my identification. Damn I want a suit of my own. I had the exact same thought as Sam. Congrats on joining the 501st officially, by the way. Uwooo! That was so cool suit! ! What that suit made of? slightly more than 1k, not including the other accessories. since u live in the US, it’s much easier to get a suit. I don’t need to see your identification. unfortunately the armour is kinda like one size only. probably not cos i’m going to attend may’n’s concert and do some looking around, shopping etc. it’s not that heavy. it’s hot and is made of White Glossy .090 Gauge ABS Plastic. yes it does. not to mention covered with sweats too. Just wondering, do you still planning to wear glasses or are you you planning to get a set of contacts when wearing that? suddenly this reminds me of wearing the gas mask during my active days.. then we have to like run for few hundred meters. hey what’s with the number! tell us! Yeah !! An anothre 501th member ! I met many members of the 501 French garrison during the conventions. we have always enjoyed playing. hmm.. 8316.. your three sizes!!? No way. Is it an old ID number perhaps? Congratulations on your armor and joining the 501st Garrison. 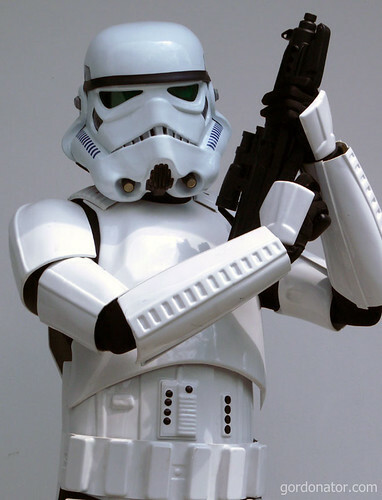 Will you be trooping around in armor? ehh, well, I kind of miss my ID, sir…Lol. Congrats on joining the 501 legion. (I wonder if theres something like that near here..hehe). I would like to be in the Legion too!! the ID starts from 001 and it’s already taken. let me see your identification. the glasses are able to fit in thankfully. lol. no need for salute. leave that to lord vader. ah comrades from far away. probably no. can’t dance to save my life. those that can be worn? I can just see my savings flowing down the drain from getting the suit…I so need to get a job. How is the damage? SGD rates. dude, if u are interested to join after NS, let me know. over 2000 in the legion. i try not to get armour from ebay. too dangerous. nothing additional is added inside the helmet.